Nike likes to say “Just Do It,” and when you look at all the crazy stuff the sportswear giant does, it may be more than just an empty slogan. If designers need input from athletes on new shoes, they prototype it with 3D printers. They test speed suits for Olympians in wind tunnels for 1,000 hours. And when they need to move key people around the globe, they gas up one of their many Gulfstream jets. Located minutes from Nike’s ever-expanding World Headquarters campus in Beaverton, Oregon, Nike has built some of the most spectacular corporate aviation facilities anywhere in the world. At a corner of Hillsboro Airport (HIO) you will find Nike’s Air Hangar 1 and the new Ochoco Private Hangar, and inside of them, Nike’s own air force of top-of-the-line business jets. Let’s take a look at Nike’s insane air fleet and futuristic air force base. Built in 2002, Nike’s corporate hangar is aptly named Air Hangar 1 (a reference to their iconic Air Force 1 shoe) and can sustain flight operations to any of the six continents where the company’s employees and subcontractors work. The facility is capable of sheltering three full-size business jets, while also offering amenities like a gourmet kitchen, a fitness center, a lounge and lavish meeting spaces. At 40,000 square feet, Air Hangar 1 is an alcazar for aircraft and a palace for passengers. The facade is reminiscent of a Tetris game, with blocky, angular surfaces joining to create a strong, purposeful presence. Inside, Air Hangar 1 is quintessentially modern, with soaring glass and crisp interior treatments. As fantastic as it is, Air Hangar 1 only constitutes part of Nike’s footprint at Hillsboro Airport. Roughly a decade after opening their first hangar, Nike’s fleet of aircraft outgrew their original fortress of flight. In 2014, a new structure rose adjacent to Air Hangar 1 for the private use of Nike’s billionaire co-founder, Phil Knight. Officially named Ochoco Private Hangar and occupying nearly 30,000 square feet, Knight’s personal hangar is large enough to house two massive private jets. Ochoco is also the name of a National Forest in Central Oregon. Maybe money is growing on those trees? Ochoco Private Hangar features a giant mural depicting historic Hayward Field at University of Oregon, where Knight ran as a college athlete. The mural highlights a cast of characters including legendary track coach and Nike’s other co-founder, Bill Bowerman, as well as prolific Oregon runner Steve Prefontaine and former Nike marketing partner Spike Lee. How much did Knight’s unbelievable new hangar cost? In addition to the $7.6 million in construction expenses, Port of Portland documents show that Ochoco Administrative Services, LLC paid $177,143 in development charges as well as an initial year’s rent payment of $53,327. Although this is big money, considering the hangar can hold a pair of Gulfstream 650s or Bombardier Global Expresses costing about $130 million combined, it is small change to keep a roof over their heads, even if that roof is an ultramodern facility designed by one of America’s top architectural firms. Between Air Hangar 1 and the Ochoco Private Hangar, up to five full-size business jets can be sheltered at once. As of this writing, five different aircraft registration numbers are associated with the company. A sixth registration (N72NC) has been reserved by the company but is not currently assigned to an aircraft. Nike has operated many different aircraft over the years, mostly a range of Gulfstreams as well as a Dassault Falcon 2000EX. Today, the company’s flagship is a beautiful Gulfstream G650, wearing tail number N6453. Phil Knight also operates another Gulfstream G650 (tail number N1KE) for his personal use (see photos below). As with many aircraft in private ownership, those owned by Nike and/or Knight often re-use registration numbers. Because the company regularly acquires new aircraft, tracking their fleet is a rather complicated endeavor. For example, the N1KE registration first appeared on a Gulfstream III that the company operated in the early 1990’s. The N1KE registration later appeared on a Gulfstream IV, then a Gulfstream V (the same aircraft currently wears N6458) and is now worn by Knight’s personal G650. The significance of the N6453 tail number is particularly interesting. The numbers 6453 spell “NIKE” on a touchtone telephone keypad and are the last four digits of the company’s corporate headquarters main number. The N6453 registration has also been used on several of the company’s aircraft over the years, including a Gulfstream III, a Gulfstream IV, a Dassault Falcon 2000EX, a Gulfstream V and now the company’s flagship Gulfstream G650. Knight’s personal G650 is painted to match the University of Oregon’s football helmets. The feathered livery mimics Nike’s “LiquidMetal HydroChrome” finish and pattern seen on the Ducks’ oft-changing uniforms, extending over the port-side engine nacelle, the entire tail and underside of the wings. In case the registration wasn’t a dead giveaway as to the jet’s owner, the exterior of the winglets sport a Swoosh. Nike’s Gulfstream G550 aircraft wearing tail number N1972N displays a very unique livery that includes track spikes painted on the underside of the wings and the original Air Pegasus shoe (designed by Nike CEO Mark Parker in 1982) on the inside of the winglets. The orange color used throughout the exterior mimics the color on Nike’s shoe boxes. The tail number N3546 (appearing on one of two Gulfstream V’s) is 6453 backwards, which also bears significance in Nike’s history. The numbers 3546 spell EKIN on a touchtone telephone keypad, which is an homage to Nike’s EKIN team. In Nike lore, an EKIN is an employee (who often sport backwards Swoosh tattoos on their ankles) tasked with traveling to retail accounts to train salespeople on new product releases. Because they must know their product backwards and forwards, the EKIN name is most appropriate. There are at least three LLC’s controlled by Nike or Knight that are directly associated with aircraft ownership. An inquiry with the FAA registry database lists Hum-Air LLC, Hum-Air Too LLC and Hum Air 33 LLC as sharing the same physical address as Nike’s Corporate Headquarters. Two other aircraft are owned outright by the company, listing the corporate hangar at Hillsboro Airport as the physical address. 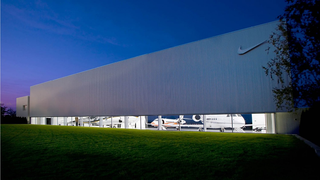 Nike’s aircraft are often seen at Hillsboro Airport’s Global Aviation, a conveniently-located Gulfstream service center. The proximity of Air Hangar 1 and Ochoco Private Hangar to Global Aviation saves Nike and Phil Knight considerable time and money, as the jets can undergo routine maintenance without having to fly elsewhere for those services. A Gulfstream G650 has a 7,000 mile range while carrying eight passengers and a cruising speed of 685 miles per hour. This provides Nike executives based in Oregon access to destinations all over the world much more quickly and comfortably than they ever possibly could if they relied solely on commercial flights. The Gulfstream G650 was in a sudden death shootout with the Cessna Citation X for the title of World’s Fastest Business Jet. For a short while, the G650 usurped the Citation X’s claim to the title, until a 2012 upgrade to the “new Citation X” that included elliptical winglets restored the Cessna to the top spot. Nike’s executives could have easily purchased a slightly faster aircraft in the new Citation X (the “new Citation X” is only 7 miles per hour faster than the G650 at top speed) but in doing so they would’ve sacrificed over half the range that the G650 provides. Prioritizing long range makes complete sense for Nike, given the widely-dispersed layout of the company’s global infrastructure. Having access to a private air force and the proper infrastructure to support it provides Nike’s corporate leadership the capability to meet suppliers, visit customers, attend high profile events and move key human resources with total impunity. One of the best benefits of Nike’s incredible jet fleet and facilities is making a big impression on athletes. LeBron James has been photographed several times onboard the company’s aircraft, a privilege his peers in the NBA certainly covet. You know you’re good when NBA players are jealous of you. Special thanks to TVA Architects and Russell Hill for granting permission to use their images in this post (TVA for the hangar pictures, Russel for the plane pictures). Make sure to check out all of Russell’s amazing aviation photography work here.